In the Sixth Richard Sherlock Whodunit, there’s a Confluence of Challenging, Concurrent Cases. First, Sherlock is summoned into the principal’s office to help investigate a caper in the cafeteria. There’s enough missing milk money for the school to buy its own cow. At the same time he’s trying to sniff out insurance malfeasance as thousands of dollars of premium cigars go up in smoke. And if those aren’t enough to keep him busy, there’s a cancerous, crime going down in Chicago’s Chinatown that’s completely confusing. 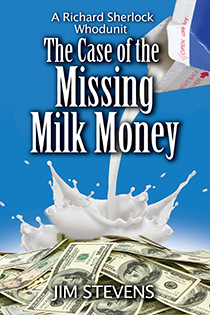 Three cases, all of which are based on recent, true-life crimes, have Sherlock up to his ears in milk, smoke, cancer cures, and duties as the best man. What’s a reluctant detective to do?